An earthquake has helped seal off a traditional fishing spot in Mexico, pleasing conservationists but hurting locals who depend on an annual fishing frenzy to sustain their economy. The villages of the Colorado River delta in Mexico normally would be bubbling with excitement now about the coming high tides that produce a bounty of fish each spring. This is when a sea-going species, the gulf corvina, gathers in the upper Gulf of California off the mouth of the Colorado River, then rushes like clockwork during the high tides of March and April to spawn in the safer fresh water up the channel. At a place called El Zanjon, an indigenous tribe, the Cucapá, and poor delta residents have long netted the corvina spawn. On isolated salt flats along the river channel, fishermen and their families converge to launch open skiffs, called pangas, to deploy gill nets to grab as many corvinas as possible. The once-a-year haul is shipped fresh to urban areas, selling out immediately and generating enough cash for the rural folk to tap the rest of the year. Extreme climatic conditions — from searing heat to punishing winds to unpredictable seas — are common in the sparsely populated region. But an already cruel Mother Nature may block access to this year&apos;s bonanza, just as it did last year. In 2010, a 7.2 earthquake shifted land formations, allowing tides to flood the normally dry salt flats, which served as the route to the river channel. The added water from the new tidal pattern has improved the environmentally threatened estuary, protecting what scientists see as overfished species, like the corvina. But the shift also imposes a hardship for Cucapá and others who rely on the corvina bounty in one of the most productive artisanal fisheries in the gulf. The changed environment pits the Cucapá, who claim ancient privilege to catch corvina, against other Mexicans who fish from two government-approved landing sites at the river’s mouth — at El Golfo de Santa Clara to the east and San Felipe to the west. A week before Easter in 2010, during the year’s highest tide, the isolated riverbank at El Zanjon was converted to a round-the-clock, fish-processing operation. From villages throughout the delta, fishermen had driven south over kilometers of barren flats to the channel just north of the river’s mouth. There, the tides rise and fall about 15 feet twice a day, undercutting the riverbanks and making them prone to dangerous collapses. Along the bank, families camp in tents and vehicles, cooking and supporting the toiling fishermen. Returning pangas, often filled to the gunwales with corvina, swamp at times. Pickups pull heavy sleds of fish up steep riverbanks, delivering the salmon-size fish to assembly lines that gut the fish. A new sport has evolved: panga surfing down the steep riverbanks made slick with discarded fish guts. The Gulf corvina (Cynoscion othonop-terus) owes life to the spring spawns in the diminishing channel where the Colorado River flows into the Gulf of Mexico. In a miraculous migration, they return each spring to rush up river exactly at high tides to spawn in the fresh water with fewer egg-eating predators. The resulting fingerlings then go to sea to become what historically was a major component of the biomass of the Gulf of California. 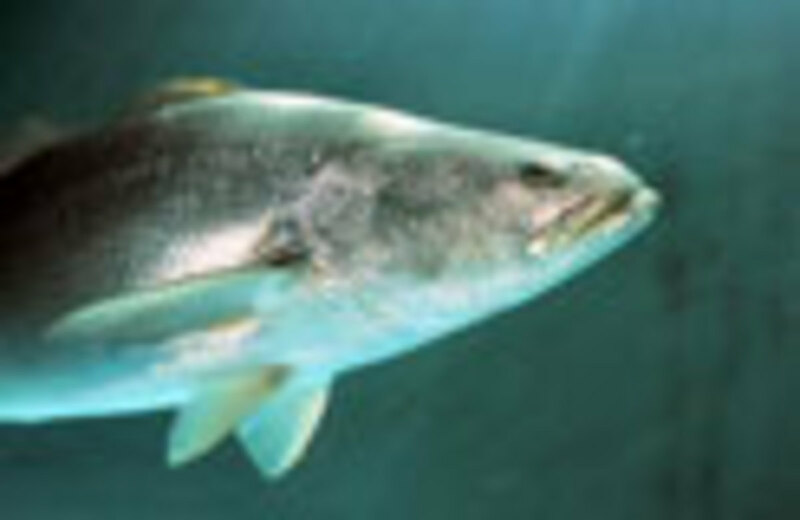 Such corvina spawns were common in Pacific waters as far north as California before dams halted river flows. On occasion, relative of the Gulf corvina still can be found during the summer poking for river mouths in shallow waters near San Diego. Meanwhile, the assembly line delivers the gutted fish to caravans of trucks and cars that carry the whole carcasses to the closest town, Indiviso. There, buyers for major markets purchase the fish, which are loaded aboard refrigerated tractor-trailers for trips to places as far as Mexico City. The fishery for corvina in the upper gulf pumps $2 million to $3 million a year into the economy, according to researchers from the Scripps Institution of Oceanography. But on April 4, 2010, Easter Sunday, a 7.2 magnitude earthquake centered south of the border city of Mexicali sunk or shifted stretches of tidal flats. So the high tides surged north — blocking access to Zanjon. Last April, fishermen and their allies built an earthen causeway a few kilometers across the flats in an attempt to reach the channel to launch boats. But the tide proved too strong, washing out the causeway. “Yes, Mother Nature won,” said a fisherman who could only sit on higher land, drinking a beer and waiting for the waters to recede so he could retrieve his panga and stranded pickup. An effort is underway now to rebuild the causeway, but it may meet the same fate. “It is incredible,” says Francisco Zamora Arroyo, an environmental geographer who studies the region through the Sonoran Institute in Tucson, Arizona. Zamora’s team is digging canals to use the new flows to improve the estuary — one of the most environmentally vibrant but challenged regions in the hemisphere. North of the border, the Colorado has long been dammed, but what river water and agricultural runoff that is allowed to flow into the gulf still provides a vital spawning ground for sea-going fish, one piece in a complex mosaic of species. Here at the river’s mouth, where the meandering riverbed varies from 20 to several hundred feet wide, a long, semicircular dike guards the rich agricultural lands to the north from marine incursion. 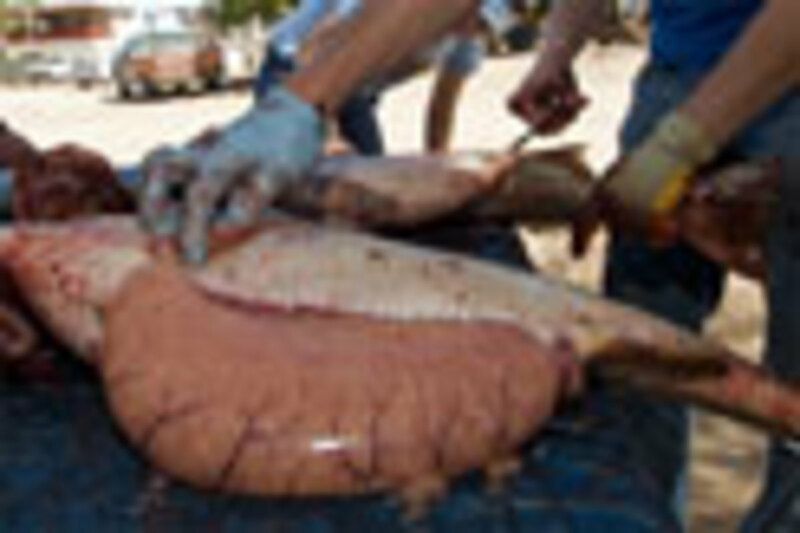 Weighing in at 220 pounds and more than 6 feet long, the totoaba (Totoaba macdonaldi) is one of the largest and most prized food fish meandering through the Gulf of Mexico. Each spring, the remaining schools of the majestic fish — the largest of the Sciaenidea family — return to the mouth of the Colorado River to spawn. Aggressive fishing and a lack of fresh water flowing from the heavily dammed Colorado have combined to put them under constant threat of extinction. While locals love their tasty flesh, some cultures, like the Chinese, covet their air bladders for soup. While fishing for them has been outlawed for years, discreet inquiries in some villages still can produce fillets from illegal catches. About 20 years ago, the Mexican government created a reserve where the Colorado River meets the Gulf of California. (Read about other efforts to preserve the area.) The reserve is meant to protect various threatened species, such as the totoaba and the world’s most endangered marine mammal, a harbor porpoise called the “vaquita,” which drowns in gill nets. By putting limits on fishing, an ancillary effect of the reserve would be to ensure healthy spawns of corvina, boosting an important component of the gulf’s biomass. Fishing in the channel — the core zone of the reserve — can be harmful, scientists say, because fish that make it into the river can be caught before they spawn. During the 2010 high tide, waist-high piles of fish guts and bloated pink sacs of millions of eggs were everywhere. Along the desolate coast of the upper Gulf of California, an elusive harbor porpoise, the vaquita, (Phocoena sinus) clings to life — the most endangered marine mammal in the world. An estimated 500 of the 4- to 5-foot-long mammals are believed to remain. In 1993, a preserve was established at the mouth of the Colorado River to protect them, but illegal gill net fishing there is believed to have driven their main population further south along the coast near San Felipe, where an additional reserve was created. 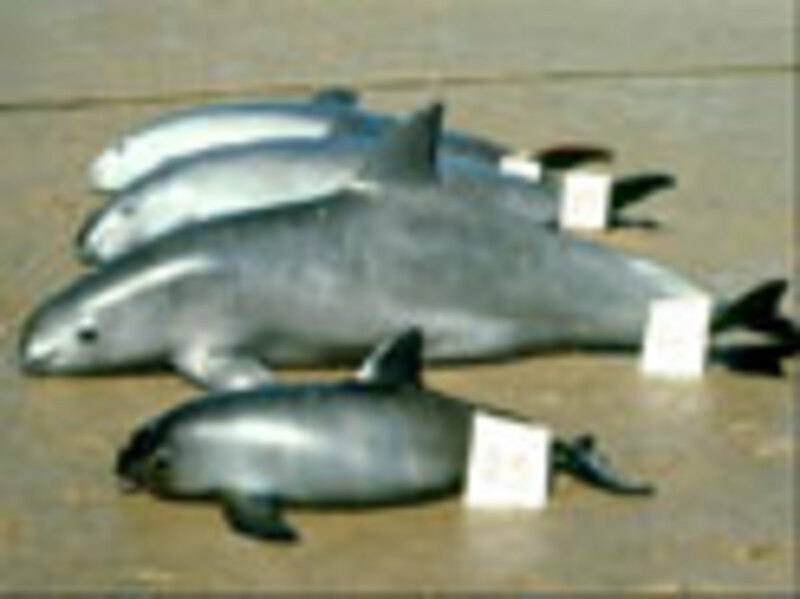 Combined U.S. and Mexican surveys have filmed the hardy porpoise, but gill-netting fishermen claim the species already is extinct, arguing recent videos are faked. Over the years, if too many corvina are caught before spawning, the species’ future could be threatened, especially since the Colorado spawn is one of the last such migrations along the Mexican and California coast (others have largely ceased because of the damming of rivers). Catching the majestic totoabas before they spawn likely contributed to the near demise of that species. Such heavy fishing at migration bottlenecks can have dire consequences. Brad Erisman, who leads the Scripps team, noted that in a 2010 paper that four out of five such “aggregation-based fisheries” saw spawns decline or end. Adding to the problems at the Gulf of California reserve, this same terrain is a major drug smuggling corridor — the scene of periodic battles between the military and narcotraficantes in boats and planes. Reports abound of fishermen hauling narcotics when not setting nets. In years past, economic pressures — plus lax government enforcement amid dangerous conditions — often meant fishermen and their allies engaged in wholesale illegal commercial fishing, or that the Mexican government didn’t enforce the landing quota for corvina. The Cucapá maintain they have historic rights to fish in the river channel, while Mexican scientists supporting the reserve contend fishing is prohibited there. Example of a panga, an open skiff used to fish for corvina. Last year, a reported 3,700 tons of corvina were landed at the two coastal villages. The government has set a much lower quota this year, 2,300 tons. Meetings between various stakeholders are underway to debate the new quota and enforcement. In January, a government agency that monitors fishing announced higher enforcement for El Golfo and El Zanjon, but there has been no word on what the main environmental protection agency will do. For 2013, the government plans to require a new permit specifically for corvina. As often happens on the ground, enforcement comes in cycles. In the upper gulf, the Mexican Navy and government environmental protection agencies typically have let fishermen venture into the reserve to fish at the earliest high tide in March, then crack down later on subsequent tides. During last March’s high tide, fishermen from El Golfo and San Felipe streamed their pangas toward the river mouth, observers say. At night during corvina season, the reserve can look like a Los Angeles freeway because of bobbing skiff lights. But by mid-April, the pangas were all pulled up on shore with fish-cleaning operations closed down, apparently because of late season enforcement after a wild scene that March. Octavio Aburto Oropez, another Scripps team member, has been studying the biology of how the corvina migrate to the upper gulf, congregate off the river mouth, and sweep in together to spawn. Examining tide and moon cycles, they found the fish migration into the river channel was highest two to four days before a full and new moon — making them easy targets for fishermen. When corvina season arrives, Mexicans with no connection to the tribe also blend in and fish at El Zanjon. In 2010, some pangas had the name “Cucapa” crudely printed on their sides as a way to masquerade as indigenous fishermen; but they didn’t bear the distinctive tribal plaque. And in 2011, some fishermen on the route to El Zanjon acknowledged they were not Cucapá. 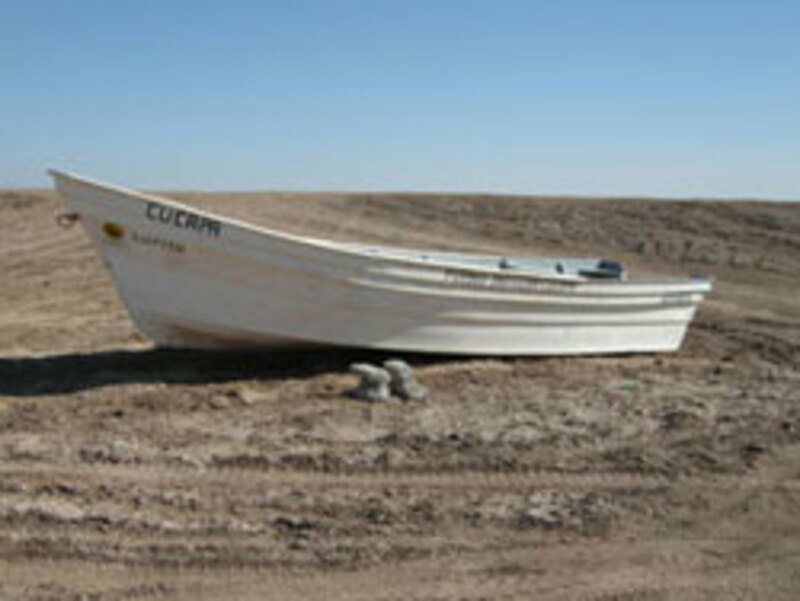 A panga beached nearby bore the name of a village on the other side of the Gulf of California. “It’s amazing how the Cucapá population expands when the corvina run,” said Karl Flessa, a paleobiologist at the University of Arizona in Tucson who has studied the Colorado delta for years. His focus is on the impact of reductions in fresh water flowing in the river channel. Less fresh water means certain species – like clams, a major food source – will disappear when fresh/salt water balances are disrupted. Flessa and Steven Nelson, a retired U.S. federal land manager from Vancouver, Washington, have used satellite photos and field trips to define the new tidal incursions. They are working with the Sonoran Institute and other environmental groups in Mexico to enhance water channels within the delta to encourage species growth. Up river a few kilometers from the mouth, Zamora’s team is carving a small canal through a sand bar that effectively blocks fresh water from flowing south, and surging tides from riding north. “We are looking to improve the connectivity of the estuary,” says Nelson. With funds from U.S. groups like the Packard and Marisla foundations, the conservationists will have hand-dug one trench 500 meters long for the fresh water; by next month, a similar canal is to be completed allowing tides to flow north. All this bodes well for improving sustainability in the estuary and the upper gulf, but much depends on the government’s enforcement of fishing zones and quotas. Meanwhile, heavy equipment is running daily in an attempt to build a causeway for access to El Zanjon. The state of Baja California had crews hauling dirt for about five kilometers of causeway toward the river channel. By the end of January, the causeway extended a few hundred meters. Given the soft earth used and tidal waters permeating the salt flats, the causeway’s days seem numbered. “I don’t think it will last very long,” said Zamora. On the wind-swept tidal flats, history indicates Mother Nature typically holds the strongest hand; for instance, the Easter earthquake was the largest in more than a century in the region on the southern line of the San Andreas Fault. Ironically, the quake’s epicenter was near the Cucapa’s main villages. The quake was so violent the land split open in seams across the valley, spewing water, sand, and gases while destroying much of the delta’s irrigation canal system. The canals largely have been rebuilt, new communities of government-funded houses created, and roads repaired. But small tremors still shake the region, sometimes daily — seemingly reminding everyone of the power and needs of Mother Nature as this year’s corvina run approaches. Dependency and balance, two attributes that aren't immediately associated with human fishing, prove their value on a remote corner of Baja.